I am not too picky when it comes to vegetables, but the one I never seemed to like was brussel sprouts. I had tried them many ways with no luck. So when my friend Judith over at The Midnight Baker told me she had a great recipe, I decided to give them another shot. 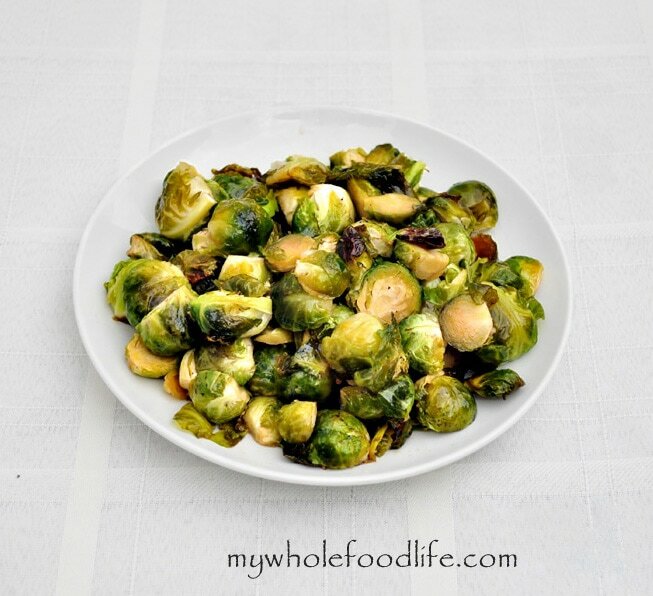 This Maple Glazed Brussel Sprouts recipe was so good that I could not stop eating them. I am a believer for sure now. These are amazing. Even my husband could not stop eating them. This will become a staple in our house for sure. This recipe is almost as addicting as my Cauliflower Popcorn. Wash brussel sprouts, remove the ends and cut in half. Place the brussel sprouts in a large bowl. In a small bowl, whisk the oil, salt and maple syrup. Pour over the brussel sprouts and mix well. Place the brussel sprouts on a lined baking sheet. Bake in the oven for 30 minutes, stopping to flip the sprouts halfway through. We've just started this healthier way of eating recently so I'm not yet familiar with coconut oil. I can't afford to throw out all my pantry items, but am replacing things slowly. Is there a substitute for coconut oil? If not, will add that to next shopping trip..never been a fan of Brussels sprouts, but these sound great! These were incredible! I set my convection oven to 425 and they got all charred and crunchy. What a great recipe. My new favorite way to eat Brussels sprouts! Thank you! So glad you liked them! I could eat an entire tray of those. So yummy! I have always loved Brussel sprouts and have stir fried, steamed and sautéed them with many veg- variations, but discovering all your creative recipes today was a national holiday for my palate! Off to the greengrocer to snag some fresh ones..and coconut oil. Cannot thank you enough. Oh Yum! Yay!! One of my favorites! Yes, the hype is true. These are delicious. My family was already a fan of B. sprouts, but we usually have them oven roasted with A LOT of garlic. This sweeter interpretation was a big hit with all 3 of us as well - even the 8 year old. Thanks again, Melissa. Looking to make these for Thanksgiving! Can they be made in advance? Are these healthy because my daughter and I just demolished almost a whole pound of them? I could eat these every day! Sounds like what happens in my house haha!